Every culture seems to have its version of dumplings, but for me it’s all about the Chinese repertoire, which is extensive. 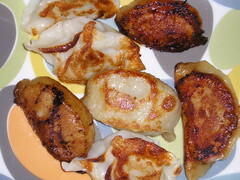 It started, for me, with potstickers. It was love at first bite, lo those many years ago – so many that I’m not quite sure where or when that was. But I also enjoy steamed dumplings, and if I’m at a dim sum brunch, I am happy to try as many varieties as are offered, including Har Gow, the tiny steamed ones with shrimp filling.